Explore more games and downloadable content for DEAD OR ALIVE Xtreme 3 Scarlet! - This content is only applicable to DEAD OR ALIVE Xtreme 3 Scarlet. - The rights to use this content will be applied after your PS4™ system is connected online and you sign in to PlayStation™Network. - This content will add 300 "Premium Tickets" to be used in the game. The purchase history can be confirmed in "Library" or "Services". - To exchange these tickets for items in the game, you will require the amount of tickets specified for each item. - The exchanged items cannot be exchanged back. - Discarded items are not recoverable. If you have discarded an item, you will need to purchase it again in the Owner Shop. - Information regarding exchanged items will be stored in the main save data. If you overwrite the save data, depending on the content of the new save data, the exchanged items may be lost. - The amount of available exchange tickets is recorded and managed on the server, not in the save data. 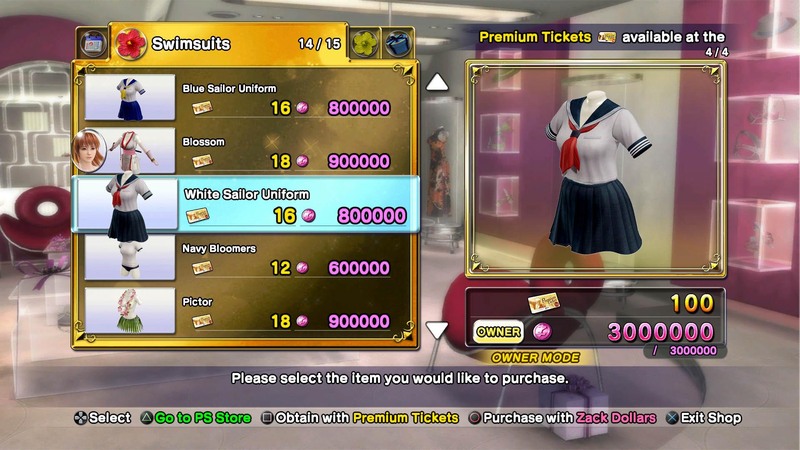 300 Premium Tickets that can be exchanged for new swimsuits in the DEAD OR ALIVE Xtreme 3 Scarlet!